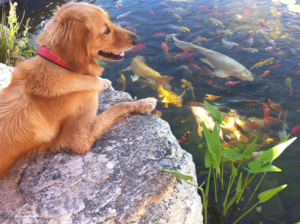 5 Critical Tips for the Summer Pond Season - Aquascape, Inc.
As we approach the dog days of summer there are things that you need to remember about your water feature in order to keep a balanced ecosystem pond along with happy fish! Take a moment to refresh your memory with these 5 critically important tips. Aquatic plants such as waterlilies help provide fish with shade from the heat of summer sun, cooling the water and making algae control easier too. Is there really a leak? Often, people do not realize how much water can evaporate from a pond during the dog days of summer. The Midwestern states typically lose 1 to 1.5″ of water each week. Pond owners in the hot, arid Southwest have reported evaporation levels in excess of 3″ a week. Remember, these are averages. Some ponds may not experience evaporation levels this high. Other ponds with large pumps pushing high volumes of water, or ponds designed with multiple waterfalls and a lot of cascades and splashing may have evaporation rates much greater than these.